What better way to celebrate National Poetry Month than a reading with the Nasty Women Poets at the Dickinson Museum? Bring a nasty poem to share for the open mic! 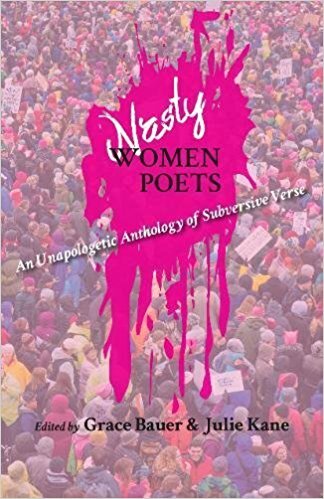 This Arts Night will feature readers from NASTY WOMEN POETS: An Unapologetic Anthology of Subversive Verse, published in 2017 by Lost Horse Press. This timely collection of poems speaks not just to the current political climate and the man who is responsible for its title, but to the stereotypes and expectations women have faced dating back to Eve, and to the long history of women resisting those limitations. Janet E. Aalfs, poet laureate emeritus of Northampton, MA and founder/director of Lotus Peace Arts at VWMA has recently returned from co-facilitating a performance program called Labyrinth Through Fear: A Gift Event in Langa township, Cape Town, South Africa. Her poems have been published widely, and her most recent book is Bird of a Thousand Eyes, Levellers Press. Kathleen Aguero’s most recent book of poetry is After That (Tiger Bark Press). She teaches in the Solstice low-residency Master of Fine Arts in Creative Writing Program at Pine Manor College in Chestnut Hill, MA. DeMisty D. Bellinger’s writing has appeared in many places, including The Rumpus, and her chapbook, Rubbing Elbows, is available from Finishing Line Press. She teaches creative writing at Fitchburg State University. Julie Cyr has been published by Smoky Quartz, Five 2 One Magazine, Blood and Thunder Journal and Broad River Review. Julie holds an MFA in creative writing from Lesley University in Cambridge, Massachusetts. Amy Dryansky’s poetry collection, Grass Whistle, received the 2014 Massachusetts Book Award. Her first, How I Got Lost So Close To Home, was published by Alice James and individual poems appear in a variety of anthologies and journals. She’s the current Poet Laureate of Northampton, MA. Gail Hanlon’s poetry has appeared in Kenyon Review, Ploughshares, Cincinnati Review, CutbankOnline, Iowa Review, and Best American Poetry, among other journals and anthologies. She edited Voicing Power: Conversations with Visionary Women (Hachette), and has published SIFT, a chapbook (Finishing Line). Rage Hezekiah is a MacDowell and Cave Canem Fellow who earned her MFA from Emerson College. Her poems have appeared or are forthcoming in Fifth Wednesday, Tampa Review, Salamander, and West Branch, as well as other journals.